If you’re familiar with my blog, you’ve probably noticed that I’m not anti-wheat or anti-grain. In fact, I think the majority of the recipes I’ve posted so far have included grains in some form or another. This isn’t a post about why I choose to eat wheat when other people are choosing to avoid it, though, so I’ll just summarize by saying that I think that properly-prepared grains can be part of a healthy diet for those who don’t have a sensitivity to gluten. I also don’t believe that there’s anything inherently wrong with wheat or other grains. I do believe, though, that the way modern grains are processed and made into bread can have detrimental effects on our health. Modern wheat is actually quite different from the wheat that our great-grandparents’ generation used, and it’s even more different from the wheat that our ancestors used in earlier centuries. Over the centuries up until the 1960s, wheat has gradually changed, but the heirloom varieties such as einkorn, emmer, spelt, red fife, etc. still shared many similarities. The modern dwarf wheat hybridized in the 1960s, however, was a much more drastic change than the gradual transition over the centuries from einkorn to emmer to spelt. Traditional bread used homemade yeast as the rising agent. This yeast was usually either a sourdough starter, or a yeast made from distillery barm. Many 19th century cookbooks include recipes for making homemade yeast using hops, potatoes, or a flour-water-sugar mixture. Modern bakers yeast as we know it today didn’t even exist until the late 1860s. Even then, it was slow to gain popularity at first because it was more expensive than making homemade yeast, and many housewives were reluctant to try something different from the yeast they were accustomed to using for baking. Traditional homemade sourdough yeast essentially sours or ferments the dough, allowing anti-nutrients such as phytic acid to be broken down and making minerals and vitamins more accessible. Some studies are even showing that the sourdough fermentation process can make the proteins in wheat such as gluten easier to digest. When you compare modern bread and traditional bread, one of the most noticeable differences is the amount of time that the bread rises. 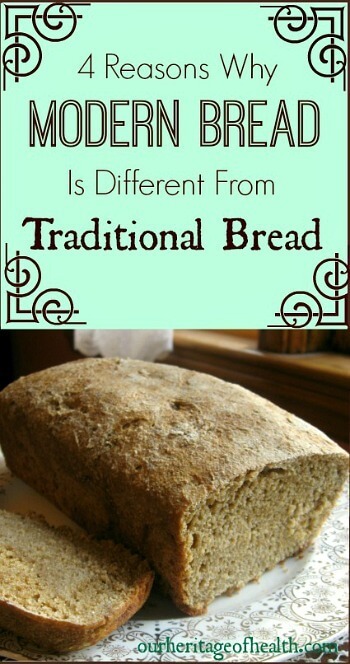 Traditional bread has a much longer rise time than modern bread does. Most old-fashioned bread recipes call for letting the bread rise for at least overnight and sometimes longer than that. When I make sourdough bread, I usually let it rise for about 12-18 hours in the summer time and 18-24 hours in the winter since my kitchen is always very warm in the summer and very cold in the winter. Modern bread, on the other hand, only rises for a couple of hours, and sometimes even less if using rapid rise yeast. And that’s for homemade bread. Many commercially-prepared breads include additives that allow them to rise even faster so that more loaves of bread can be produced in a shorter period of time. Traditional bread recipes usually have just five or so ingredients: flour, water, yeast, salt, and either some type of sweetener or maybe herbs or spices. If you look at the ingredient list on a loaf of modern bread, though, you’ll almost always find a lot of extra ingredients that you can’t even pronounce. These extra preservatives, artificial flavorings, stabilizers, and enhancers weren’t part of the traditional bread-making process. They might help the loaf of bread rise faster and keep it from molding while it sits on a store shelf for several weeks, but they are unnatural additives that aren’t doing our health any good, and in many cases, these artificial chemicals can cause negative reactions in our bodies. 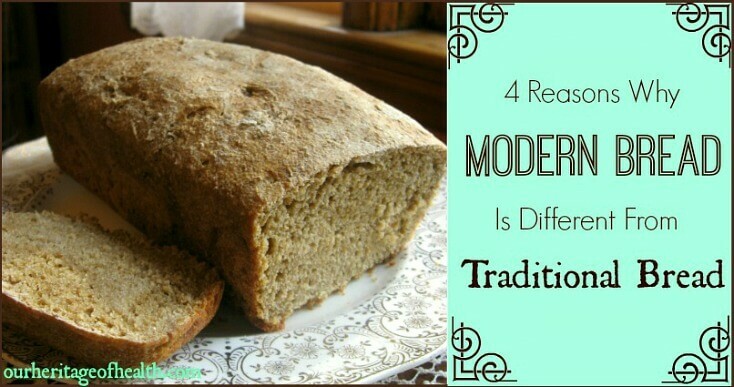 I don’t think of this as one of the main differences between modern bread and traditional bread, but another difference is the fact that modern flour is more heavily refined than traditional flour was. Even though refined flour was still used in traditional baking, it wasn’t refined to the same degree as it was after the invention of modern steel roller milling in the late 1800s. Because of these four reasons, I choose to make homemade bread whenever I can. The way I bake bread is basically the same as the way that my great-great grandmother might have made bread back in the 1800s. I use heirloom varieties of wheat – usually a blend of organic spelt, einkorn, and barley (you can find those flours here). I also sometimes buy spelt berries and use my grain grinder to get freshly-ground flour. I use my sourdough starter as my rising agent, and I let my bread rise for at least 12 hours. And, of course, since my bread is homemade, I can pronounce every ingredient in it, and I don’t use any weird chemical additives. Thank you for this information. I have been wondering. Sorry about that, Laura! What I actually meant was that I had listed the sources at the bottom of the post. I couldn’t figure out a way to link to the end of the post, so I was just putting a note there to let people know where they were. I am not anti gluten either. My “gut” tells me it is fine for my family and I in moderation. I think it gets a bad wrap due to the problems over-processed foods have caused. But I must admit, I like yeast bread better than sourdough. If we get flour made in another country such as Italy, would it be more natural? I have this theory, since reading WheatBelly and only buy pasta from Italy now. What are your thoughts on this? Thanks. I haven’t done much research yet into the differences between American and Italian flour, but just recently, I read this post (http://thekitchenrag.com/2013/12/gluten-intoleranceyoure-next-in-line.html) by Diana Glasser, and she said that her family has no problems eating the bread made from their homegrown wheat in Moldova, but when they visited America, they were having a hard time digesting bread made from modern American wheat. Moldova isn’t Italy, but it seems like there is a good possibility that there is a difference between American flour and flour from other countries. I love your blog and so happy I found it. I wanted to ask your opinion on Italian wheat, bread & pasta. I’ve heard it’s more similar to the “old fashioned” type of wheat. Do you know this to be true? I’m still doing some research on it myself, but wanted to know what you thought. Love the blog, I’m now a subscriber!! I’m still doing research on this, too, but I think there’s a good possibility that Italian wheat may be more similar to old-fashioned wheat than our modern American wheat is. I recently read this post (http://thekitchenrag.com/2013/12/gluten-intoleranceyoure-next-in-line.html) by Diana Glasser, and she says that her family has a hard time digesting bread made from American wheat, but they have no problem eating the bread made from the wheat that they grow themselves in Moldova. It seems like there are some definite differences between American flour and flour from other countries, so it’s possible that Italian flour hasn’t been modified quite to the extent that American flour has been. Excellent post and very well said. I agree with you about grain. Although I am gluten and grain sensitive and cannot consume most grains I believe this is due to the many changes, processing and genetically modified of our grains and foods. We have put so many unnatural ingredients in our foods that our bodies can not tolerate them. We need to go back to nature. Thanks for sharing this information on Real Food Fridays. have a wonderful healthy day. Thanks for a good blog, Lori. Here are some comments for you all. We in the UK use a lot of Canadian wheat, which is probably the same as the wheat grown in the northern US. (We’ve been importing it for nearly two centuries.) It bakes better bread at home than the local British ‘soft’ flour (ie, less gluten) and is UK milled and sold specifically for bread. In the UK, though, additives are extremely limited by law, and have been since the mid-’80s. Bleaching is also now outlawed because it destroys nutrients. Nearly all bread flour has only one additive: L-Ascorbic Acid, which is a form of vitamin C and helps to prevent rancidity in the flour. I reckon that the key problems I’ve seen (and tasted) in US flour and breads are all to do with either growing or preparation practices. If you specify organic flour, that should fix most of what people are rightly complaining about. The differences between wheat varieties are real, but far less important than considering your whole diet. In other words, if you’re using, say, spelt for health reasons, first take out of your eye that plank of massive sugar overdose, trans-fats, bad fats and overdosing on proteins before you even consider such a trivial speck as wheat variety! Marla, you’re certainly partly right, but I’ve seen a lot of gluten-sensitive people lose their sensitivity once they adjust to a wholesome, traditional diet, ignoring almost all manufactured foods except for the occasional (a few times a month) treat. Roller milling has certainly been responsible for a degradation in nutrition, but it’s also meant that food is cheaper – same for modern, high-yield wheat varieties. The key for good health seems to be to eat whole foods as much as possible, and major on a high vegetable intake. Even roller-milled flour is fine as long as the extracted bran and wheatgerm are returned to the white flour, rather than being sold as an expensive ‘health additive’. This is what we in Britain call ‘wholemeal’ flour and is, I think, the same as ‘whole wheat’ your side of the Pond. Stone milling is still better, though, because the coarser grains of flour digest more slowly, avoiding the insulin rush that makes modern white flours (any kind) almost as bad as drinking neat corn syrup (eg, Coke). Back before roller milling, in any rich household one of the least liked jobs for a servant was sifting the flour in a fine hair sieve. It took several hours each day to produce enough fine, white flour for the Family’s bread next day; the servants then ate bread made with the remainder – an ‘enriched’ flour by our standards. 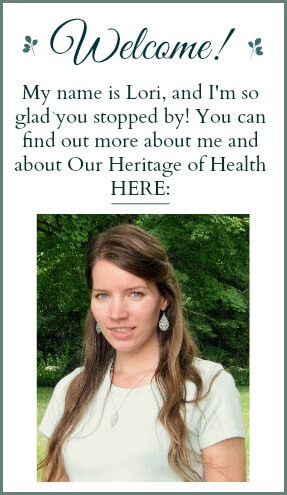 Guess who had better health! Last point on European bread. In most of Europe, bread has traditionally been made from mixed grains. The famous French baker who supplied a whole village twice a day (true French bread ‘keeps’ for only a few hours and the morning batch is stale by late afternoon) used mostly wheat, but would and does still today add barley, rye and other grains as needed in season to keep the price right. So for the poor, bread generally came from what was most plentiful, and this has come down to us as traditional recipes. In Eastern Europe, rye and barley are still common flours. Germany and countries nearby even have pure rye bread, including the sourest of all, Pumpernickel (no added cocoa, etc!) In Italy, there are two distinct kinds of flour: softer flour for ordinary bread, and super-hard flour for pasta, from specially-grown wheat varieties. So if you are importing Italian flour, Anne-Marie, you’ll need to know which kind it is. I do think, though, that immigrants to the US from Moldova would find traditional US breads no problem; it’s your revolting soft, sweetened ‘plastic bread’ (as we Brits call the modern sliced loaf – and yours are worse than ours) that might be hard to stomach, for the reasons you’ve mentioned, Lori, as well as trying to adapt from the more traditional diet common in eastern Europe to the All-American, big-corporation promoted junk diet. I have found decent bread in most US cities I’ve visited, usually by looking for whole food shops, though some supermarkets do have it. In the UK, good bread is now commonplace, and most superstores bake constantly. But it’s not cheap, either in the US or UK, so poorer immigrants would have to avoid it! Ignore notts Dave, the bread in the UK is pure poison. Even ‘healthy’ bread sold in the UK, is the same crap topped up with a tiny amount of good ingredients. Basically British bread is too cheap to be good and few want to spend on quality. Dim, you’re three decades out of date! And quality bread has been a big seller for a long time. As well as baking at home, I buy more expensive, store-baked supermarket loaves, rather than the cheap stuff (which is, by law in the UK, safe – though not tasty! ), and I’ve looked at the ingredients lists that they have to keep for customers to see, by law. They are pure, as I said above. But today, almost the whole of those bad additives are out of all but the cheapest manufactured foods in the UK, and usually isn’t in them, either. Last Christmas, trying to find pure foods in California, though, was just as unwelcome as before – including in some of the ‘pure foods’ stores. So the UK has changed, under pressure, but it’s coming slow in the US. A word on yeast starters: I do begin my own from wild yeasts, but I find the live yeast used by my local supermarket (they will sell it to me from the bakery if I ask!) is just as good, and our Health Store dried yeasts are, too. Quick breads with a lot of yeast, fast or slow proving (warm or cool conditions, in other words) sourdough or not – all these are personal preference. So is the ‘hardness’ of the flour – the amount of gluten and other proteins. I bake bread a lot at home, and I like using ‘old-style’ flours – but good modern wheat varieties are fine, too (remember, ‘modern wheat’ is over 3000 years old). In the last few years, I have had to use specialist bakers and specialist millers less and less, and all the big supermarket chains locally have all that I need for regular baking – including spelt and einkorn, rye and barley flours. 30 years ago, that wasn’t true. Thank you for the feature, Marla! so what could be done to get rid of harmful varieties in the region where I live for the moment (middle east) Government officials are corrupt and feed their own people with wheat produced in western countries and the even force local farmers to plant the modern wheat. That’s a difficult situation and one that’s not easy to fix unfortunately. I’m not sure what could be done to get rid of the harmful varieties that you mention, but you could try to buy better quality wheat for yourself personally anyways. Thank you for the information. Nice article. Reason I read it in the first place is I just finished another breakfast with soft, floppy toast made from commercial bread and I decided to search for the reason. I was certain there must be a new additive because I’ve been making toast for nearly 70 years but in the last decade or so it seems to have lost its crunch when toasted. Your article validates my suspicion, and I am now confident one of those culprits removed the crunch. I guess that means I’ll have to find time to bake more of my own bread. My recipe a couple more than the basic ingredients…flour, yeast, milk, water, olive oil, and salt…but still toasts up nice and crispy. Yes, I agree with you about the floppy toast! Homemade bread might take a bit more time to make, but I think it’s worth it!